China is beginning to see the costs of its rapid march towards industrialization -- the heavy industry, coal-fired power plants, and numerous factories have so saturated the air with pollution that cancer is officially now the number one cause of death. 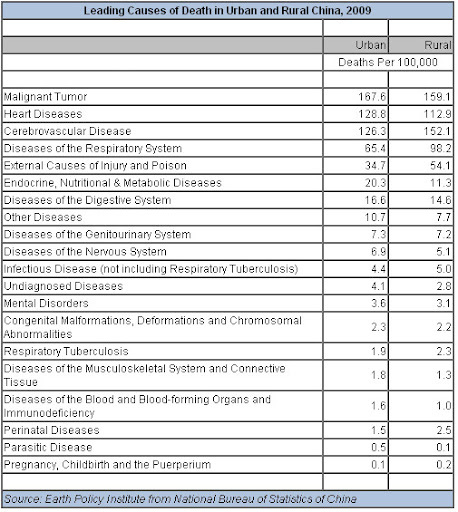 Nearly 25% of deaths in China are now attributed to cancer. Earlier this year near the release of China’s latest 5-year plan, the New York Times quoted Chinese Prime Minister Wen Jiabao’s proclamation that “We must not any longer sacrifice the environment for the sake of rapid growth and reckless roll-outs.” Yet while official rhetoric recognizes the importance of preserving the environment and the health of its people, the Chinese government still has a long way to go in bolstering transparency and enforcement of even the existing environmental regulations, not to mention strengthening protection. If it does not do so, the country’s toxic burden threatens to stall or even reverse the dramatic health gains of the last 60 years, which raised average life expectancy from 45 to 74 years and slashed infant mortality from 122 deaths per 1,000 births down to 20. Economic gains could be lost as productivity wanes and massive health bills come due. Ultimately, a sick country can prosper only so long.